A complete gift - at a great price! 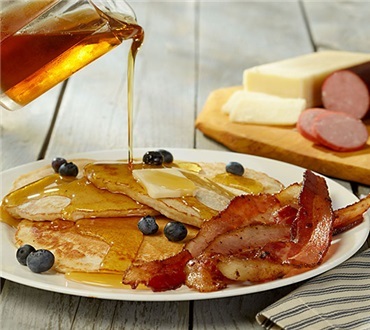 This tasty gift box contains a complete bacon and pancake breakfast along with our customer's favorite snack items for a well rounded and welcome gift to enjoy during the holidays or any other time of year. The products are always fresh, kept cold and avsolutely fantastic! This product is great. The quality of the food is excellent and the packaging was perfect for a two day trip to Florida. Everything arrived fresh. I would recommend this to anyone. I will be purchasing more in the future for gifts. The gift basket was a nice Christmas morning surprise. I really enjoyed the assortment of breakfast items. I can't wait to order again. The cob bacon was incredible! I love these products we received as a Xmas gift from my husbands brother in Vermont. So fresh tasting. You can really tell the difference in the Cobb smoked bacon vrs supermarket bought. Everything is awesome. You can't go wrong.